This match analysis was first featured on our dedicated analysis site, totalfootballanalysis.com. Two months have passed since the first Red Bull Derby in the UEFA Europa League. RB Leipzig and FC Red Bull Salzburg played out a thrilling 3-2 contest with FC Leipzig snatching three points from with a late goal. Matchday five hosts the fixture again with the FC Salzburg in pole position six points clear of the pack. Both RB Leipzig and Celtic F.C are level on six points after Celtic’s emphatic win against the East German club on matchday four. A win for FC Salzburg would guarantee top spot and passage into the knockout stages. RB Leipzig will need a positive result to stand a chance of qualifying without relying on FC Salzburg. With Celtic F.C expected to beat pointless Rosenborg, the pressure was on RB Leipzig to perform. The hosts hadn’t been beaten at home in over two years making them slight favourites in what promised to be a hotly contested encounter. Credit: Google – Group B as it currently stands. FC Red Bull Salzburg made three changes from their 5-2 thrashing of Rosenberg on matchday 4 with Takumi Minamino, Amadou Haidara and Jérôme Onguéné replaced by Hannes Wolf, Marin Pongračić and Zlatko Junuzović. Haidara has been ruled out till the new year with an injury. Marco Rose has set up his team in his usual 4-1-2-1-2 formation with Hannes Wolf spearheading the diamond in midfield. Andre Ramalho, Stefan Lainer and Andreas Ulmer have been mainstays of the Salzburg defense this season and continued with another start. Xaver Schalger was the general in midfield in his usual deep-lying playmaking role. Europa League top scorer Moanes Dabbur and Frederick Gulbrandsen started up front to capitalise on their pace and strength to penetrate RB Leipzig’s defensive line. The East German club made five changes from their game at the weekend against VfL Wolfsburg with Péter Gulácsi, Ibrahima Konaté, Yussuf Poulsen, Marcel Halstenberg and Lucas Klostermann all dropping out. Emil Forsberg is still missing with an injury with Marcel Sabitzer, Kevin Kampl and Diego Demme all left in Germany. Yussuf Poulsen’s physicality is still available off the bench to play an influential role. The Danish striker is equal on six goals in the Bundesliga with Timo Werner and has formed an effective partnership for RB Leipzig. Werner makes his first Europa League start partnered by Jean-Kévin Augustin. Ralf Rangnick lined up in a 4-3-3 formation that defensively morphed into a 5-3-2 with Stefan Ilsanker dropping in as a half-back. 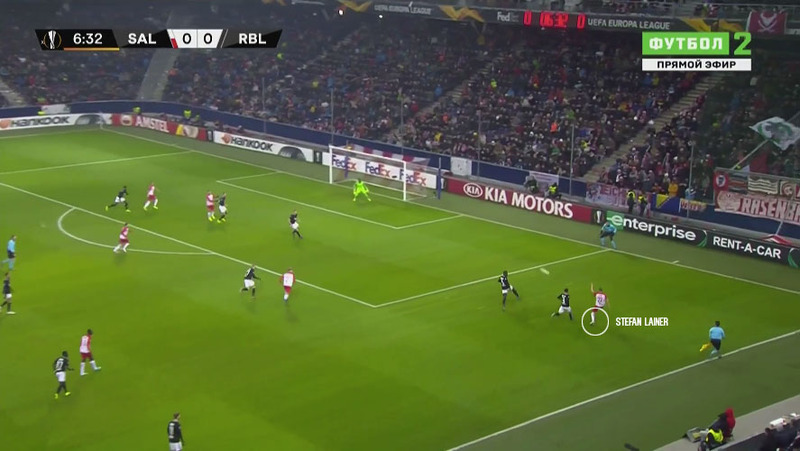 FC Salzburg dominated proceedings from the off. What was thought to be an exciting encounter turned into a passing game for the Austrians. RB Leipzig was set up to counter-attack using the pace of Jean-Kévin Augustin and Timo Werner. Moanes Dabour and Fredrik Gulbrandsen were used to penetrate the Leipzig defense with their pace and strength with the energetic Hannes Wolf providing support from deep. Credit: Wyscout – RB Leipzig’s passing lines and average positions. 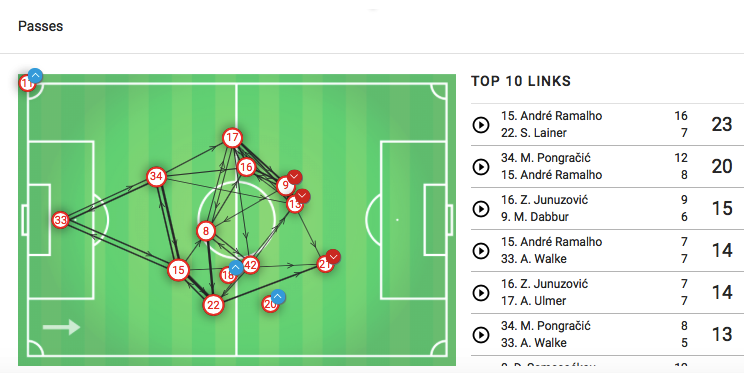 Credit: Wyscout – FC Salzburg’s passing lines and average positions. While both defenses looked solid early on, the real battle was in midfield. The winner would ultimately win the game. With both sets of full-backs heavily involved the onus was on the two defensive midfielders to provide sufficient cover to ensure the safety of the centre-backs. Diadie Samassekou and Konrad Laimer played key roles in screening their defenses but it was the Salzburg defensive midfielder’s contribution that was most telling. Not only did he intercept intelligently but contributed by initiating attacking moves. The full-backs were critical to both sides. Andreas Ulmer and Stefan Lainer acted as Salzburg’s main outlet. Playing against a side that looked to counter-attack with a narrow formation, using the two full-backs would open up the pitch and allow for more crosses and pull-backs to find a way through. Even RB Leipzig resorted to their full-backs in Nordi Mukiele and Marcelo Saracchi. Two of their three substitutions were full-back changes showing their intent in keeping those two positions fresh. This play started as Dayot Upamecano attempted to clear the ball, his clearance reached Diadie Samassekou who intercepts the ball and puts it back in Leipzig’s defensive third. In the same passage of play, FC Salzburg begins to construct another attack with Samassekou finding Stefan Lainer. The right-back bombed forward interchanging passes with the midfielder before finally getting a cross into the box. Samassekou’s final pass to the Austrian right-back forced Dayot Upamecano to move across and support Marcelo Saracchi leaving a gap for Gulbrandsen to run in to. Credit: Wyscout – Diadie Samassekou putting the ball back in the path of the right-back to cross. The Mali international was also tasked with marking one of Jean-Kevin Augustin or Timo Werner and block off any attempts to counter-attacking from deep. These trademark runs have tormented many defences in the Bundesliga but Marco Rose was prepared and Samassekou responded by keeping the German forward quiet for 90 minutes. Timo Werner is RB Leipzig’s talisman and attacking spearhead and is usually the main source of goals for the East German club. In this example, we can see how Diadie Samessekou follows Timo Werner who dropped deep to collect the ball from midfield. As he tries to turn the Malian, Samessekou was intelligent enough to run away from Werner and intercept the ball rather than tackle him from behind giving away a needless free kick. Credit: Wyscout – Diadie Samassekou looking to close down Timo Werner. The Norwegian striker was a livewire all evening. The forward was chosen ahead of Takumi Minamino who had scored a hat-trick against Rosenborg in their previous Europa League game and many expected the Japanese striker to partner Moanes Dabbour. Gulbrandsen justified his selection after scoring the winning goal. It wasn’t just his goalscoring exploits that earned him plaudits but his overall work-ethic contributed to the victory. The forward had 21 attempts at ball recovery winning five but more importantly was the constant pressure he applied in Leipzig’s final third. Gulbrandsen’s unpredictable movement and positioning disrupted Leipzig’s shape and organization which contributed towards the goal. There were several moments in the match which hinted towards Gulbrandsen’s unorthodox movement. In this example, we can see Gulbrandsen sitting on the shoulder of the defenders with Dabbur spotting the Norwegian strikers movement. He lifts a ball over the top and Gulbrandsen shoots straight at the goalkeeper. Credit Wyscout – Dabbur looking for the run of Gulbrandsen. The winning goal came from a smart cross from Andreas Ulmer. Zlatko Junuzović played a creative pass into the path of Andreas Ulmer who had space to run in to. Matheus Cunha should ideally be tracking back in the right-back position covering the empty space. With the Leipzig defence rushing back to block the cross, the Austrian left-back patiently scans his options and decides to pull one back into the path of Gulbrandsen. All throughout this move the Norwegian striker was left alone to run into the box. After finding space in the penalty area, Gulbrandsen places his shot and scores the winning goal. Credit Wyscout – Zlatko Junuzović with a wonderful pass to Andreas Ulmer. Credit Wyscout – Gulbrandsen taking advantage of the quick break. Credit Wyscout – Options assessed by Ulmer who finds the Norwegian striker in space. The game lacked any real potency and chances were hard to come by. The game was ultimately decided by one goal and FC Salzburg’s constant pressure and movement caused RB Leipzig all sorts of issues. This result combined with Celtic FC’s efficient win against Rosenborg means it will go down to matchday six where RB Leipzig must beat Rosenborg and hope FC Salzburg avoid a loss against the Scottish champions. As for FC Salzburg, the Austrian champions have now secured top spot and have qualified for the knockout stages. They will look to maintain a 100% unbeaten record and qualify with maximum points. Every week a new player seems to emerge and steps up to the mark for FC Salzburg giving Marco Rose a selection headache. FC Salzburg has been my dark horse pick to make a run all the way to the final and lift the UEFA Europa League trophy. With the UEFA Champions’ League group stage places to be decided, a number of potential candidates will drop down and only strengthen the tournament making the achievement much more rewarding. A twenty-seven year old sports writer in between jobs. Writer for the Red Bull Analysis. Tactical analysis aficionado. A Chelsea supporter who has an open love affair with Olympique Lyon.